In 1905, Einstein invented a concept which was substantially identical to Poincaré’s “principle of relativity,” which Einstein also called “the principle of relativity.” In effect, Einstein, like Lorentz and Poincaré in 1904, arbitrarily converted the sensory and empirical concepts of Galileo’s Relativity, and the coordinate measurements of its abstract relativistic successors (Lange’s inertial reference frames and the Galilean transformation equations), into a mathematical concept that included the Lorentz transformations and theoretically applied to electrodynamics and optics, as well as mechanics. Einstein’s ad hoc and artificial “principle of relativity” was also premised on numerous other false assumptions and it also resulted in many invalid mathematical consequences. So, like Lorentz’s and Poincaré’s 1904 theories, it was always both spurious and meaningless. In the last chapter we demonstrated that the various concepts of matter (including Galileo’s Relativity) are completely different and irreconcilable with respect to concepts of electromagnetic waves (light). As a result, the concepts and conventions of matter (including relativity) are completely irrelevant to the velocity of light (Figure 24.1A). But different uniform rectilinear velocities of anything (i.e. 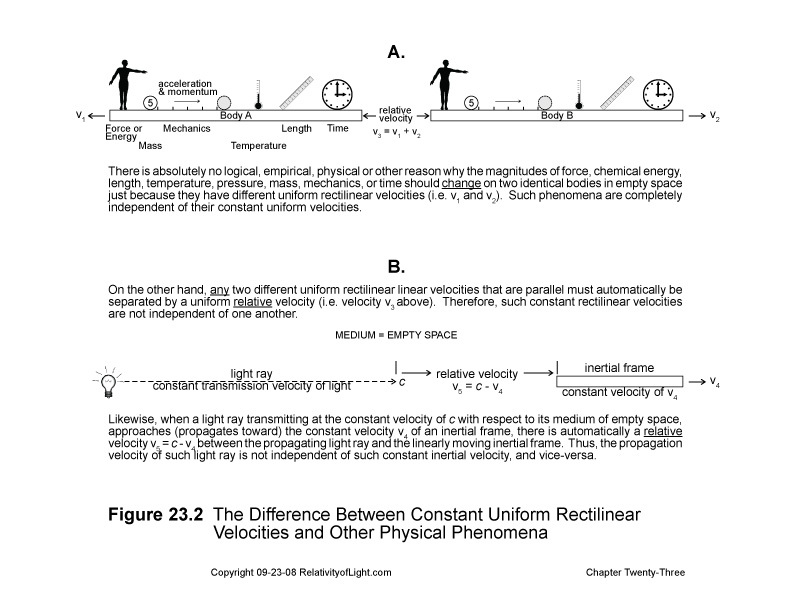 light or material bodies) are not irrelevant to each other; they always result in a relative uniform velocity (Figure 23.2B). 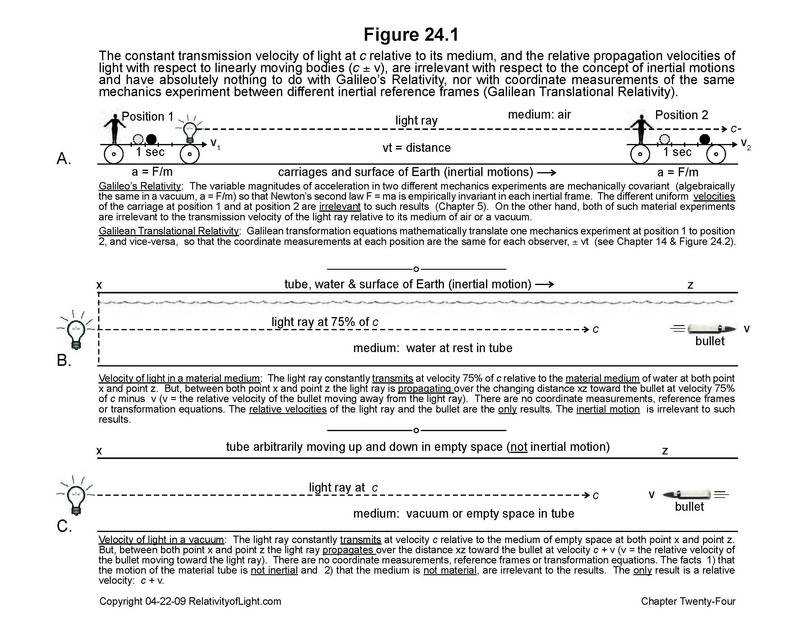 We also demonstrated in the last few chapters, that the misanalysis and misinterpretation of the phenomena of the velocities of light (see the Preamble), and the misapplication of the concepts and conventions of matter (especially relativity, coordinates, the Galilean transformation equations, and inertial reference frames) to the constant velocity of light at c are primarily what caused the “difficulties” that Einstein and the scientific community imagined. Galileo’s (and Newton’s) empirical, physical and material principle of relativity only stated that the laws of mechanics (the motions of material bodies) operate and accelerate in exactly the same way no matter at what uniform rectilinear speed they are traveling (Chapter 5). Nevertheless, in 1904, Poincaré conjectured that this limited principle of mechanics should also apply generally to all physical phenomena, including electromagnetics and optics (light). But why? Electricity, EM radiation and light are not physical phenomena in the same sense that material bodies are (Chapter 23). Poincaré’s only rationale for such conjecture was that the inertial motion of the Earth through the ether could not be detected by electromagnetic experiments conducted on Earth, just like terrestrial mechanics experiments cannot sense or detect the existence of any inertial motion (Chapter 16). This rationale was completely ad hoc, unconvincing and unjustified for two major reasons: 1) the fictional stationary ether does not exist as a place from which to measure motions, and 2) in the absence of stationary ether, there is no logical, empirical or even mathematical reason why such terrestrial electromagnetic experiments should be able to detect the inertial motion of the Earth through empty space (Chapters 10, 12, 16 and 23). If mechanical motions cannot detect the inertial motion of the Earth through space with respect to the ether for the reasons previously stated, then why (in the absence of ether) should electromagnetic radiation be able to detect it? The main experiment that Poincaré was relying on and referring to was the 1887 Michelson and Morley experiment which theoretically required the existence of stationary ether in order to detect the motion of the Earth through it. According to theory, the mirrors of the M & M experiment were displacing from stationary ether, and if this were true then mathematically the light rays in Michelson’s apparatus would theoretically have a greater distance to propagate in the direction of the Earth’s solar orbital motion (Figures 9.2 and 10.1), and this greater distance should theoretically have been detectible by the interference of light method. Poincaré (like the rest of the scientific community, including Einstein) believed that these results should absolutely have happened (Einstein, Relativity, pp. 58 – 60), and they were completely mystified when the M & M experiment failed to detect such greater distance of light propagation in the direction of the Earth’s motion. This and other similar failed electromagnetic experiments finally convinced Poincaré that nature was conspiring against him. It was this alleged conspiracy and Poincaré’s frustration that ultimately drove him to his generalized principle of relativity (that here is no experimental way to detect inertial motion); not logic, reason nor empirical phenomena (Chapter 16). 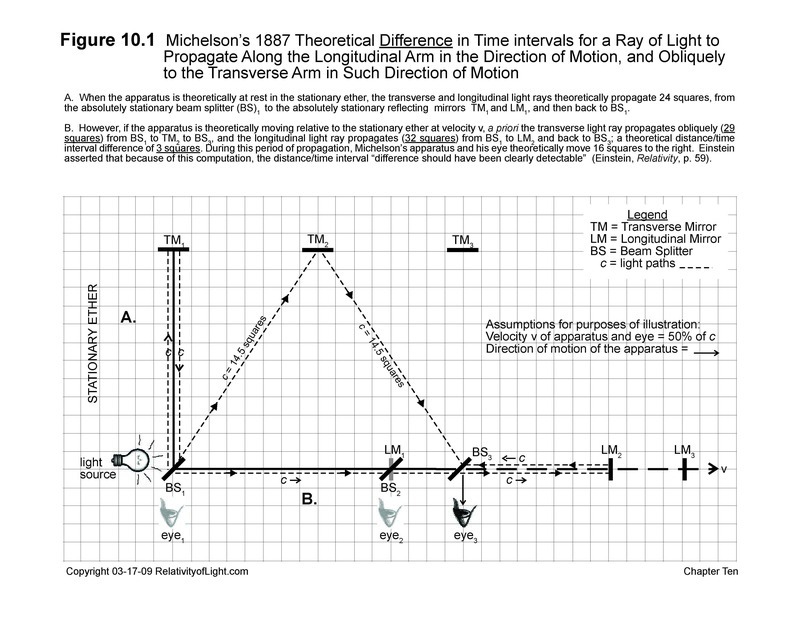 But, as fate would have it, it turned out that there was no ether, so there never was (nor could ever have been) a greater distance for light to propagate within Michelson’s apparatus (Figure 12.1). 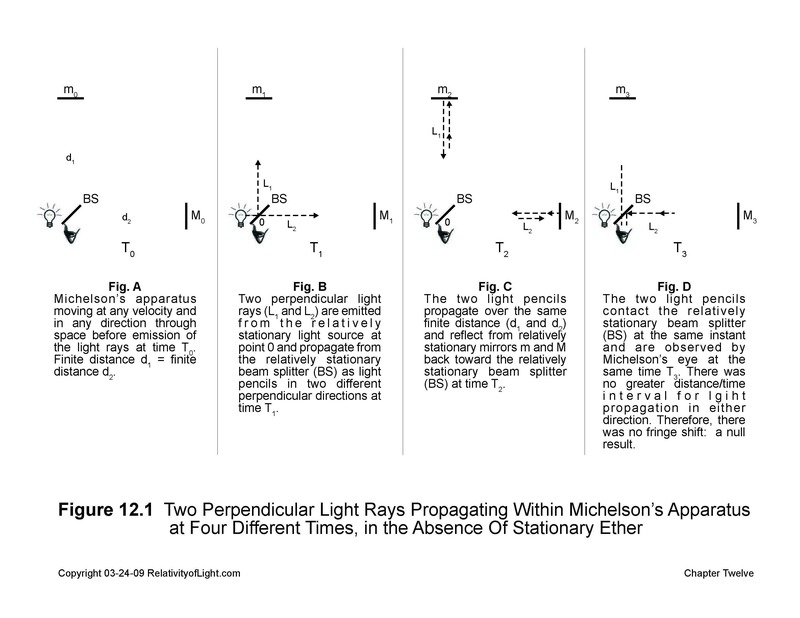 It was a mission impossible for Michelson to attempt to detect by any method a fictional greater distance of light propagation that did not exist. The real reasons for the null results of such experiment are now known, and they demonstrate why such detection of the Earth’s motion by Michelson’s apparatus was a mission impossible (Chapters 9, 10, 11 and 12). Such real reasons also demonstrate why Poincaré’s generalization of the principle of relativity (to include the non-detectability of the Earth’s inertial motion by electromagnetic experiments and optics) was totally invalid. Based on Poincaré’s incorrect ad hoc conjecture and invalid generalization of the principle of relativity to include electromagnetism and optics (light), Einstein in 1905 applied the Galilean transformations for mechanics to the velocity of a light ray at c with respect to a material object moving linearly away at v, and was baffled by the very natural mathematical result (c – v): a relative velocity (Chapter 19 and Figures 24.1B and 24.1C). But what do the Galilean transformations for material bodies, which only demonstrate mechanical algebraic covariance, have to do with non-material light? Nothing (Chapters 14 and 23)! It was a meaningless and misleading exercise to apply the Galilean transformations to light. It was an even more ad hoc and meaningless exercise for Einstein to adopt Poincaré’s invalid generalization of the principle of relativity, to adopt Lorentz’s radical transformations and to apply them to light in order to mathematically and artificially change c – v to c. Maxwell’s transmission velocity of light is always c with respect to its medium of the vacuum of empty space, and mathematically it is always c + v or c – v with respect to linearly moving inertial bodies, regardless of any transformation equations. The Lorentz transformations were completely irrelevant to the situation (Chapters 6, 21, 22, and the Preamble). “[T]ogether with the unsuccessful attempts to discover any motion of the earth relatively to the “light medium” [of ether], suggest that the phenomena of electrodynamics as well as of mechanics possess no properties corresponding to the idea of absolute rest. They suggest rather that, as has already been shown to the first order of small quantities, the same laws of electrodynamics and optics will be valid for all frames of reference for which the equations of mechanics hold good. We will raise this conjecture (the purport of which will hereafter be called the “Principle of Relativity”) to the status of a postulate…” (Einstein, 1905d [Dover, 1952, pp. 37 – 38]). In the above statement, Einstein was assuming and asserting that the failure of the first order electrodynamics (electricity) and optics (light) experiments to detect the absolute motion of the Earth with respect to the ether was an example of Galileo’s empirical concept of Relativity and was a justification for his radical generalization of Galileo’s concept of Relativity to include electrodynamics (electricity) and optics (light waves) as well as mechanics. Einstein’s above stated justification for his radical and expanded “principle of relativity” was almost identical to Poincaré’s false analogy: vis., that all experiments of “physical phenomena” (including light) conducted on inertial frames had failed to detect and measure the absolute motion of the Earth relative to the stationary ether, just like Galileo’s observer on Earth or on an inertially moving ship could not detect whether or not he was moving (Chapters 5 and 16). The only thing that was missing for Einstein’s principle of relativity was Poincaré’s mythical ether. Einstein also suggested and implied that his “principle of relativity” and analogy to Galileo’s Relativity had already been “shown,” empirically demonstrated and confirmed by relative motion (Faraday’s electrodynamic induction experiment) and by such unsuccessful experiments to detect the motion of the Earth relative to the ether. It should be emphasized that all of such failed experiments (including Michelson’s interference of light experiments) were attempting to detect and measure an impossible quantity that does not exist and cannot be detected by any method: the absolute motion of the Earth with respect to the hypothetical stationary ether (Figures 9.1B, 9.2 and 10.1). Therefore, Einstein’s theoretical “principle of relativity” was premised upon the failure of light experiments to detect and measure the absolute motion of the Earth relative to the ether (something that does not exist and cannot possibly be detected), and his justification for such failure to detect such absolute motion was that such light experiments were performed on a body (a frame of reference) which exhibits uniform inertial motion. None of this impossible scenario makes any logical sense, and it constitutes a false premise for his “principle of relativity” and his entire Special Theory. Einstein then further suggested and implied that the mathematical version of Galileo’s Relativity (the Galilean transformation equations with their inertial reference frames and coordinate measurements) should be generalized to include the non-material laws of electrodynamics and optics. Einstein switched to the mathematical version of Galileo’s Relativity from Galileo’s original sensory and empirical concept, because he specifically needed its translational transformation equations, its abstract inertial reference frames and its coordinate measurements in order to construct his Special Theory. He also needed its Galilean transformation equations, in order to blame for the “difficulties” with the velocity of light that he imagined, and as a mathematical factor for his new modified Lorentz transformations. Einstein assumed in his above generalization that all of such laws of mechanics, electrodynamics and optics must only be transformed by the Lorentz transformation equations. Why do we arrive at this conclusion? Because the Lorentz transformation equations are “the [only] equations of mechanics [that] hold good” in Einstein’s Special Theory (Ibid). Einstein’s attempted justifications for switching to the Lorentz transformations are explained, illustrated and refuted in Figure 24.2. It turns out that the so-called Galilean transformation equations are irrelevant to Galileo’s Relativity because they only translate (or shift) the same acceleration of the same specific mechanics experiment from one position or frame to another (Chapters 13 and 14). Thus, they do not demonstrate the mechanics magnitude covariance of variables F = ma in two different acceleration experiments, nor the invariance of Newton’s second law on two different spatially separated inertially moving bodies with different velocities, nor that the mechanics covariance of F = ma and the invariance of Newton’s 2nd law are independent of such relative velocities. The only type of relativity that they illustrate is the empirically meaningless translational or “carbon copy” type of relativity. The only thing that they mathematically demonstrate is that one specific acceleration of matter is velocity independent (Figure 24.2A). Strangely enough, the Galilean transformation equations are not irrelevant to the variable velocities of a light ray propagating over various distances en vacuo relative to various linearly moving inertial bodies. Rather they mathematically demonstrate that the velocity of a light ray propagating relative to any linearly moving inertial body is dependent upon the velocity v of such body, because it results in the relative velocities, c – v or c + v, depending upon the relative direction of the body’s motion (Figures 24.1C and 24.2B). On the other hand, such Galilean transformation equations are irrelevant to the constant transmission velocity of a light ray at c relative to its medium of a vacuum because, inter alia, this constant velocity (by Maxwell’s definition) has no relevance whatsoever with respect to linearly moving bodies (Chapter 6A). Such transmission velocity is only constant relative to its medium of a vacuum and its abstract point of emission in space. For this reason, it follows that the constant transmission velocity of a light ray relative to such medium is also (by Maxwell’s definition) not dependent upon the motion or velocity of any linearly and uniformly moving body. As we demonstrated in Chapters 20E and 23, it was neither necessary nor even correct for Einstein to analyze, describe or relate a ray of light the way classical mechanics and Special Relativity was analyzed, described or related: with inertial reference frames, coordinate measurements, transformation equations, and with a relativity principle. As with the concept of ether, these antiquated conventions of matter were completely irrelevant or superfluous with respect to light, EM radiation, electromagnetic waves, and optics, as well as to many other physical phenomena such as length, mass and time. “Every general law of nature must be so constituted that it is transformed into a law of exactly the same [algebraic] form when, instead of the space-time variables x, y, z, t of the original co-ordinate system K, we introduce new space-time variables x′, y′, z′, t′ of a co-ordinate system K′. In this connection the relation between the ordinary and the accented magnitudes is given by the Lorentz transformation. Or in brief: General laws of nature are [algebraically] co-variant with respect to Lorentz transformations. This is a definite mathematical condition that the theory of relativity demands of a natural law…” (Einstein, Relativity, pp. 47 – 48). Except for the absence of the mythical ether, this statement by Einstein is almost exactly the same as Galison’s description of Poincaré’s principle of relativity as it relates to Lorentz’s April 1904 transformations (Chapter 16). It should be apparent from Einstein’s above statement that there is nothing relative about Einstein’s Principle of Relativity. Instead it is an absolute concept. It is also obvious that Einstein’s Principle of Relativity is nothing more than an ad hoc mathematical convention which arbitrarily requires the algebraic form of a natural law to be mathematically symmetrical in two linearly separated inertial frames of reference at the same time. Any such natural law (including the velocity of light) only becomes symmetrical (co-variant) by being transformed from one inertial frame to another by the Lorentz transformations (Ibid). What relevance do these mathematical transformation equations have with respect to the physical and empirical laws of nature? None. What was the fundamental reason underlying all of these ad hoc, arbitrary and artificial mathematical manipulations by Einstein? The answer is as follows: the only way that Einstein could theoretically make the velocity of light an absolute magnitude of c with respect to every inertial observer in the Cosmos was to mathematically eliminate the relative distance and the relative time interval (thus the relative velocity) between two inertial reference frames and their observers. He algebraically accomplished this empirically impossible task with the Lorentz transformation equations for time and space. We shall discuss Einstein’s phony mathematical manipulation and elimination of physical laws in greater detail in later chapters. Einstein acknowledged that the law of the constant transmission velocity of light at c in vacuo, “played an important part in this process of thought” (Einstein, Relativity, p. 47). It is obvious that Einstein assumed that the algebraic form, c, of this law must invariantly remain the same for all observers in each inertial frame. Strangely enough, he was partially right. The transmission velocity of light does retain the same algebraic form of c relative to its medium of empty space (a vacuum) without any mathematical transformation. Therefore, the transmission velocity of a specific light ray at c in a vacuum, which light ray is transmitting and measured in a specific inertial frame, is automatically velocity c for any observer measuring such light ray in that specific frame. This result automatically occurs for any other observer, anywhere, with respect to measurements of another light ray made in his specific frame, regardless of the state of his motion; inertial, accelerated, arbitrary or otherwise. But this is not what Einstein was asserting, as we demonstrated in Chapter 21. Einstein was asserting that the velocity of all light rays must remain constant at c relative to all inertial frames and observers anywhere in the Cosmos all at the same time, even though they are moving linearly at v in any direction or at any velocity relative to the light ray. This is an impossibility. Again, by way of summary, after Einstein misinterpreted the velocity of a light ray atc, he misapplied the Galilean transformations to the constant (invariant) transmission velocity of light at c in the stationary frame, which caused the algebraic factor c to mathematically change to c – v in the moving frame, because the moving frame was moving at velocity v relative to the stationary frame and relative to the light ray. Then, in order to reverse or rectify this unwelcome result of his own misapplication (the “difficulties”), Einstein compounded his original blunder by arbitrarily changing the Galilean transformations to the Lorentz transformations, which would automatically and mathematically provide him with the artificial algebraic result of velocity c for both reference frames that he desired in the first place. Then, in order to remain mathematically consistent with the rest of physics, Einstein declared that all other physical phenomena were “velocity dependent” so that he could justify applying the Lorentz transformations to them also (Chapters 20G, 26 & 28). All of these arbitrary misapplications and mathematical manipulations were of course completely ad hoc and unnecessary. The net result of all this ad hoc mathematical theorizing was a hodge-podge of arbitrary rationalizations, false relativistic concepts, and absurd mathematical consequences called “Special Relativity,” which ultimately changed and distorted most of physics. “The laws by which the states of physical systems undergo change are not affected, whether these changes of state be referred to the one or the other of two systems of co-ordinates in uniform translatory motion” (Einstein, 1905d [Dover, 1952, p. 42]). What “laws by which the states of physical systems undergo change” was Einstein talking about? With regard to mechanics he was alluding to the empirical mechanical covariant change of the magnitudes of the material variables, F = ma; in other words, Galileo’s Relativity. With regard to the velocity of light he was talking about his ad hoc algebraic covariant velocity of a light ray with respect to two different inertial reference frames, where the change was from c ± v to absolute c for any inertial observer. With regard to all other physical systems of phenomena (including length, mass, and time intervals), he was conjecturing about their theoretical and ad hoc dependency upon, and change as a result of, relative velocity. We did not realize these facts until we read further into Einstein’s Special Theory, nor did we fully understand them until we read his 1916 book, Relativity. In 1905, there was no law by which the velocity of a light ray propagating over varying distances relative to linearly moving bodies changes its state from c – v or c + v to the absolute state of velocity c. Nor was there a law that all physical phenomena are velocity dependent, i.e. that a material rigid rod changes its state of length, that such material rod changes its state of mass, or that a time interval on such material rod changes its state of duration…all as a result of a relative velocity. All of these conjectured laws were merely figments of Einstein’s imagination. In Chapter 26, we will describe how Einstein attempted (but failed) to justify the existence of such ad hoc laws by the misapplication of logic, analogies and rationalizations. Then, in Chapter 27, we will describe how Einstein contrived his way to turning such conjectures into mathematical formulae (the Lorentz transformations), which he thereafter arbitrarily applied as mathematical laws without having to resort to logic, analogy or rationalization (Chapters 28 and 29). One primary difference between Poincaré’s “principle of relativity” (Chapter 16) and Einstein’s “principle of relativity” is described as follows. For Poincaré, “the “principle of relativity” was simply a summary of experimental facts” (Goldberg, p. 209); the failure of light experiments to detect and measure the absolute velocity of the Earth. It was “a convention…agreed to because it was the most convenient and simplest way of conceiving of reality without direct evidence” (Ibid). Whereas, for Einstein, his “principle of relativity” “was a postulate in a theory of measurement” (Ibid). Regardless of the fact that the “principle of relativity” was suggested to Einstein by ether experiments, “it was [still] a priori” (Ibid). Actually, it was ad hoc, contrived and empirically invalid. For all of the above reasons, Einstein’s “principle of relativity” was much more ad hoc and more artificial than Poincaré’s “principle of relativity.” Nevertheless, they were both totally invalid and completely meaningless concepts, as we shall further demonstrate in Chapters 25 through 29 and beyond. B. Einstein’s failed analogies, rationalizations and justifications for his Principle of Relativity. However, Galileo’s Relativity in both its original sensory and empirical version, and in its abstract and mathematical versions, only applied to material mechanics. As we have previously explained in Chapter 23, Galileo’s Relativity in all of such versions appeared to be totally irrelevant, incompatible, and irreconcilable with respect to non-material electrodynamics, light and optics. With these restrictions, how could Einstein proceed to construct his Special Theory? “As a result of an analysis of the physical conceptions of time and space, it became evident that in reality there is not the least incompatibility between the principle of relativity and the law of propagation of light, and that by systematically holding fast to both these laws a logically rigid theory could be arrived at. This theory has been called the special theory of relativity” (Ibid, pp. 23 – 24). “The theory to be developed is based—like all electrodynamics—on the kinematics of the rigid body, since the assertions of any such theoryhave to do with the relationships between rigid bodies (systems of coordinates), clocks, and electromagnetic processes. Insufficient considerationof this circumstance lies at the root of the difficultieswhich the electrodynamics of moving bodies at present encounters” (Einstein, 1905d [Dover, 1952, p. 38]). Einstein’s claim that his theory was based on “electrodynamics” (electric currents and their related EM effects) and “kinematics” (the abstract motions of material bodies), ignores the fact that what he was really trying to prove was an impossible absolute velocity for light at c, and that most of his later attempted proofs and applications dealt primarily with light. Actually, Einstein’s radical concepts of kinematics and his dubious applications of electrodynamics were merely an ad hoc and artificial means toward this impossible end. The purpose of the following discussion is to demonstrate how Einstein then illogically rationalized, conjectured, and contrived his way to a theoretical, mathematical, and impossible reconciliation of these two totally incompatible, irreconcilable and mutually irrelevant phenomena: material relativity and the velocity of light. The first thing that Einstein needed to do for this attempted theoretical reconciliation of relativity and light was to somehow elevate the Galilean transformation equations and Lange’s abstract concept of Galileo’s Relativity to the level of fundamental laws of nature, which of course they are not. This, in turn, would require an attempt by Einstein to characterize the limited sensory and empirical concept of Galileo’s Relativity (with its equivalent inertial motions) as the fundamental law of mechanics, which of course it is not. On the contrary, Newton’s second law of motion is the fundamental law of mechanics. Galileo’s Relativity only allows Newton’s second law to be described invariantly and demonstrated intuitively (Chapter 5). The second thing Einstein would have to do for his attempted theoretical reconciliation would be to radically modify the concept of Galileo’s Relativity so that his first postulate (his expanded Principle of Relativity) could somehow appear to apply to the velocity of light. Finally, Einstein would have to modify the Galilean transformation equations in order to eliminate the mathematical “difficulties” which they caused when he misapplied them to Maxwell’s constant transmission velocity of light at c. In other words, in order to reverse or rectify his original blunder or misinterpretation concerning the velocity of light (vis., that the constant transmission velocity of light at c had changed to c ± v), Einstein would have to (step-by-step) conjecture, rationalize, contrive, attempt to justify and defend his radical new Principle of Relativity as being based on Galileo’s sensory and empirical concept of Relativity, inter alia, so that his Special Theory would not appear to be completely mathematical and ad hoc. Einstein began this impossible and ludicrous process of theoretical reconciliation by asserting that “inertia” was the fundamental law of the classical mechanics of Galileo and Newton, which of course it is not for all of the reasons previously stated (Einstein, Relativity, p. 13). Einstein’s basis for this first misassertion was yet another misstatement of fact: that inertia provides the only “reference bodiesor system of coordinates [which are] permissible in mechanics [for the purpose of] mechanical description” (Ibid). The “reference bodies” that Einstein was referring to were those which exhibit a motion of “uniform translation” (Ibid, p. 15). In other words, they were the inertial bodies exhibiting uniform rectilinear motion in Galileo’s Relativity. Einstein, of course, should have asserted that inertial motion (uniform transitory velocity) was the fundamental basis for the concept of Galileo’s Relativity, not mechanics. Again, contrary to Einstein’s above assertions, the fundamental law of mechanicsis Newton’s second law of motion, not inertia. Why did Einstein misstate these simple facts? The answer is: because he needed to characterize the inertial motions of Galileo’s Relativity as a fundamental law of mechanics, so that he could later claim that Galileo’s Relativity had a broad application in physics (as we shall soon see). In this way, Einstein hoped to ultimately characterize and justify his radical and expanded mathematical version of relativity (which included the Lorentz transformation equations) as an empirical and fundamental law of physics. At this point in his process of attempting to rationalize, justify and defend his first postulate, his Principle of Relativity, Einstein switched from the sensory and empirical concept of Galileo’s Relativity to Lange’s abstract concept of relativity and the Galilean transformations that described it. He characterized their related system of coordinates as a “Galilean system of coordinates.” Einstein defined this system as a “state of motion” relative to which the “law of inertia [and] the mechanical laws of Galilei-Newton hold good…” (Einstein, Relativity, pp. 14, 16). Based on all of the above, Einstein took another incorrect and illogical step forward and asserted that: “[T]he laws of mechanics of Galilei-Newton can be regarded as valid only for a Galilean system of coordinates” (Ibid, p. 14). This false limitation was of course a non sequitur. The mechanics laws of Galileo and Newton are obviously also empirically and sensorally valid. If K and K′ are two uniformly moving coordinate systems, “then natural phenomena run their course with respect to K′ according to exactly the same general laws as with respect to K. This statement is called the “principle of relativity” (in the restricted sense) (Einstein, Relativity, p. 16). This radical concept was substantially the same as Poincaré’s “principle of relativity” prior to 1904, since the term “natural phenomena” in Einstein’s above statement referred not only to mechanics, but also to “electrodynamics and optics” as well (Ibid). At this point, both Einstein’s principle of relativity and Poincaré’s principle of relativity prior to April 1904 still referred to the Galilean transformations. But Einstein’s principle of relativity was “restricted” (in Einstein’s mind), because inter aliait still only applied to inertial motions and to the Galilean transformation equations. Both Poincaré’s and Einstein’s expanded material concepts of relativity were completely ad hoc, because there was (and remains) absolutely no logical or empirical evidence to support their generalizations to electrodynamics and optics (light). Uniform motions of material bodies per se have absolutely nothing to do with non-material light (Chapter 23). Einstein’s above conjecture concerning coordinates and all natural phenomena was yet another obvious non sequitur. According to Einstein, the “principle of relativity in the restricted sense” was accepted by the scientific community until the mathematical “difficulties” caused by applying its Galilean transformation equations to the velocity of light at c made it “evident that classical mechanics affords an insufficient foundation for the physical description of all natural phenomena” (Einstein, Relativity, p. 16). Einstein then asserted: that because the laws of mechanics cannot describe the laws of electrodynamics, this caused “the question of the validity of the principle of relativity…[to become] ripe for discussion” (Ibid). This, of course, was yet another illogical non sequitur. “[T]here are two general facts [arguments] which at the outset speak very much in favour of the validity of the principle of relativity” (Einstein, Relativity, p. 16). “Even though classical mechanics does not supply us with a sufficiently broad basis for the theoretical presentation of all physical phenomena, still we must grant it a considerable measure of “truth,” since it supplies us with the actual motions of the heavenly bodies with a delicacy of detail little short of wonderful. The principle of relativity must therefore apply with great accuracy in the domain of mechanics” (Einstein, Relativity, pp. 16 – 17). On the contrary, the fact that Newton’s three laws of motion (classical mechanics) in conjunction with Newton’s law of gravitational attraction results in the motions of celestial bodies has absolutely nothing to do with Galileo’s Relativity or any other version of material relativity. Therefore, the last sentence of the above quote was not only a meaningless conjecture and misstatement of fact; it was yet another incorrect and misleading non sequitur as well. “But that a principle of such broad generality should hold with such exactness in one domain of phenomena [celestial mechanics], and yet should be invalid for another [the velocity of light at c], is a priori not very probable” (Ibid, p. 17). Unless Einstein could somehow convince the reader that the above analogy and argument was true, his generalized principle of relativity and with it his entire Special Theory would fall apart. But wait a minute. We cannot let Einstein get away with those non sequiturs and phony arguments. Einstein’s above false analogy and illogical argument are like saying: the principle of atoms must apply with great accuracy to the domain of matter. But that a principle of such broad generality (vis. atoms) should hold with such exactness in one domain (i.e. matter) and should be invalid for another (i.e. the non-atomic domain of light and EM radiation) is a priorinot very probable. In Chapter 23 we demonstrated that the material concept of Galileo’s Relativity and electromagnetism (i.e. light) are completely different and incompatible phenomena of nature. It is, therefore, not only highly probable but also obvious that the material principle of relativity should be invalid for the very different, incompatible and non-material domain of light and electromagnetic radiation. For this reason alone, Einstein’s generalized principle of relativity (which included EM and light) should have been considered to be completely invalid, and he never should have proceeded with his Special Theory based on such a concocted generality of the limited concept as Galileo’s Relativity. Again, contrary to Einstein’s assertion, Galileo’s Relativity in its classical form is not a principle of broad generality. Rather, it is a very narrow and limited principle which only demonstrates sensorialythat one cannot tell whether or not he is moving, and empirically that the magnitudes of the variables F = ma in Newton’s second law of motion (mechanics) are algebraically and mechanically covariant, and therefore that Newton’s second law invariantlyworks the same way on all spatially separated inertial bodies (frames) (Chapters 5, 13 and 14). Why should this very narrow and simplistic 17th century concept of the sensory equivalence of a particular state of motion of material bodies (vis. uniform rectilinear motion), which was used for the solepurpose of demonstrating the empirical equivalence of distantly separated material accelerations in order to confirm the invariance of Newton’s second law of motion, apply to any other “domain of phenomena?” On its face, it certainly does not. In fact, there is no empirical evidence that any version of Galileo’s Relativity should apply to any natural phenomena other than the terrestrial mechanics of material bodies. Galileo’s Relativity in any form does not apply to the domain of gravity, because this phenomenon only deals with the accelerated (rather than the inertial) motions of material bodies. Galileo’s Relativity in any form does not apply to the domain of thermodynamics, because the laws of thermodynamics essentially remain the same on any material body, regardless of its particular state of motion. The same could be said of the domain of chemistry, biology, nuclear physics, and many other domains of science as well. Why then did anyone think that Galileo’s Relativity in any form might apply to the domain of electromagnetic waves, optics and the velocity of light? The answer might lie in the fact that EM rays and light move or propagate from one material body to another. For centuries, scientists had treated anything that moves in the same way. So why not attempt to apply Galileo’s Relativity in some form to a “moving” ray of light? We have already discovered why not in Chapter 23. The two phenomena are completely different, incompatible, and irreconcilable. For all of the above reasons, none of Einstein’s above definitions, analogies and arguments is the least bit persuasive as a rationale or justification for the application of his ad hoc principle of relativity with respect to light or its velocities. Einstein’s postulate of relativity remains completely artificial and empirically invalid. It was never anything but an unconvincing and contrived ad hoc concept. As a foundational postulate, it becomes another false premise for his Special Theory. Einstein also advanced a second argument in favor of the broad applicability of the principle of relativity (in the restricted sense) to all natural phenomena. It was the empirical equivalence of all terrestrial inertial motions, regardless of their direction through space. 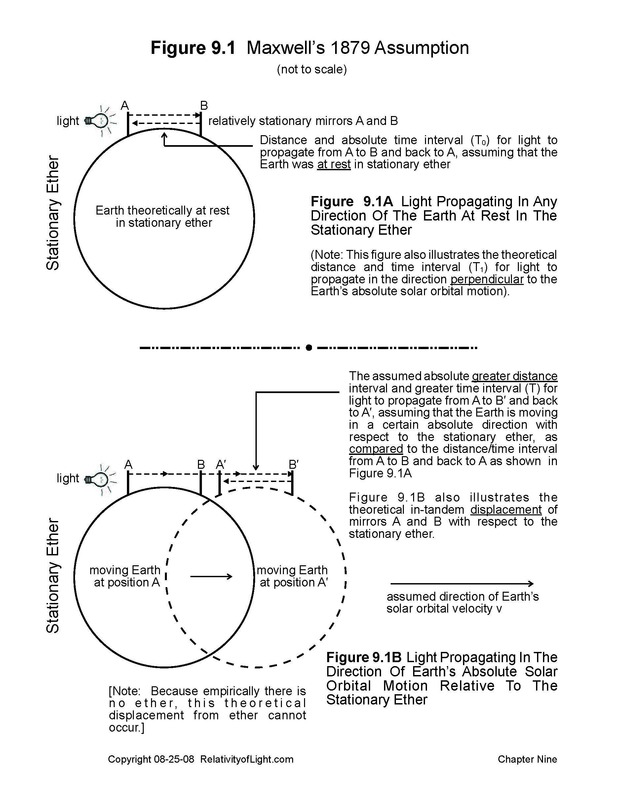 In other words, the quasi-inertial motion of the Earth in its orbit around the Sun in many different directions does not appear to affect or change the laws of nature on the Earth (Einstein, Relativity, pp. 17 – 18). Einstein called this physical equivalence of all directions in space, the “principle of relativity with respect to direction,” or the “relativity of direction” for short (Einstein, 1922 [“The Meaning of Relativity,” Princeton, 1988, pp. 24 – 25]). This directional equivalence of all inertial motions through space, may be valid; but it has almost nothingto do with Galileo’s Relativity…the sensory equivalence of all inertial bodies for the purpose of demonstrating the perceived equivalence of accelerations on them and thus empirically confirming the invariance of Newton’s second law of motion. Nor does it have anything to do with the constant transmission of non-material light in any direction of empty space. For these reasons, Einstein’s concept of the “relativity of direction” is not at all persuasive as a rationale for the broad application and validity of his principle of relativity (in the restricted sense) with respect to light. 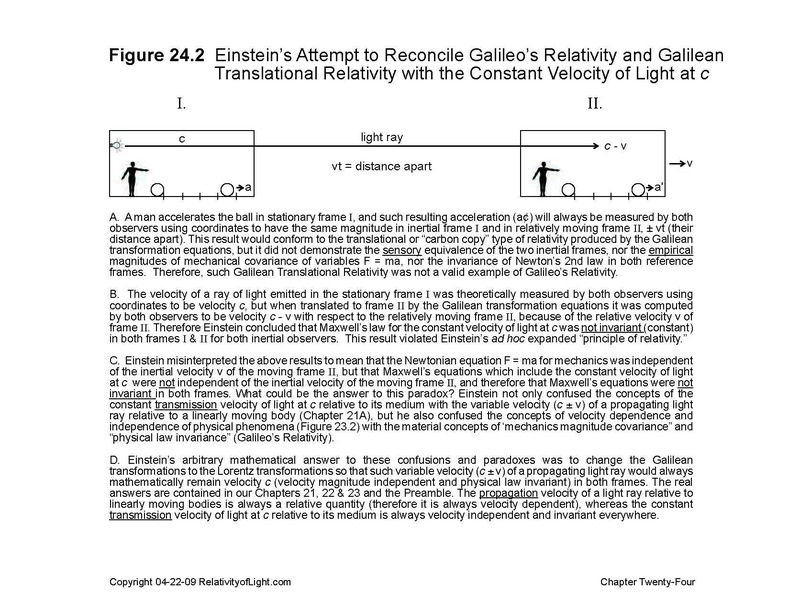 Smolin suggested a fourth argument that Einstein might have used to rationalize that Galileo’s Relativity should apply to light. Einstein started out with Galileo’s concept of the sensory equivalence of the motion of inertial bodies, which states that an observer “cannot distinguish motion with a constant speed and direction from rest…As long as there is no acceleration, you cannot feel your own motion” (Smolin, p. 219). “[A mathematical] way to express this is that there is no preferred observer and no preferred frame of reference: As long as acceleration is absent, one observer is as good as another” (Ibid). The fallacy in this mathematical analogy is, of course, its incorrect conclusion. The conclusion should be that “one inertial observer’s sense or illusion of rest is as good as another inertial observer’s sense or illusion of rest.” An illusion of rest can result in the equivalence or relativity of accelerated motions on different inertial bodies. However, what relevance does an observer’s physical illusion of rest have with respect to the velocity of a light ray that propagates through an inertial frame? Absolutely none! Nevertheless, Einstein might have asserted that a consequence of this false analogy (that one observer is as good as another) “is that the speed of light must be considered a constant, independent of the motion of the light source or the observer. No matter how we are [inertially] moving relative to each other, you and I will attribute exactly the same speed to a photon. This is the basis of Einstein’s special theory of relativity” (Smolin, p. 219). The major fallacy with this false analogy and consequence is that it is not correct. The speed of a propagating photon of light (even if it could be measured) is not independent of the different inertial velocity v of each inertial observer which will result in different values of c – v or c + v relative to the photon, depending upon the directions of such relative velocities (Chapter 21). As should be patently obvious by now, Einstein’s attempt to extrapolate and generalize any form of the material concept of Galileo’s Relativity in order to apply to the non-material phenomena of electromagnetic waves (i.e. light), or to characterize any version of Galileo’s Relativity as a broad fundamental law of nature that applies to many phenomena other than mechanics, is doomed to failure. For this reason alone, Einstein’s radical first fundamental postulate, his Principle of Relativity, which theoretically applied to light, was ad hoc, invalid, meaningless, irrelevant and irreconcilable to anything, and especially to the velocity of light at c. Also for these reasons, Special Relativity has no empirical foundation. Einstein needed further illogical rationalizations, strained analogies and conjectures in order to attempt to justify changing the Galilean transformations into the Lorentz transformations. This he would attempt to achieve with his artificial concepts of “Simultaneity” and “Common Time” (Chapter 25), with his concepts of the “Relativity of Simultaneity” and the “Relativity of Distance” (Chapter 26), and with his so-called “derivation” of the Lorentz transformations based on his two fundamental postulates (Chapter 27). On April 26, 1914, Einstein published a short article in a German language newspaper, entitled: “On the Principle of Relativity.” He described the principle of relativity “in a general fashion as: ‘the laws of nature perceived by an observer are independent of his state of motion’” (Einstein, 1914 [Collected Papers, Princeton, Vol. 6, p. 3]). “The phenomena of the optics of moving bodies lead to the interpretation that light in empty space always propagates with the same velocity, irrespective of the state of motion of the light source. Yet this result seems to be in contradiction with the aforementioned principle of relativity. After all, when a beam of light travels with a stated velocity relative to one observer, then—so it seems—a second observer who is himself traveling in the direction of the propagation of the light beam should find the light beam propagating at a lesser velocity than the first observer does. If this were really true, then the law of light propagation in vacuum would not be the same for two observers who are in relative, uniform motion to each other—in contradiction to the principle of relativity stated above. “This is where the theory of relativity comes in. This theory shows that the law of constancy of light propagation in vacuum can be satisfied simultaneously for two observers, in relative motion to each other, such that the same beam of light shows the same velocity to both of them” (Ibid, pp. 3 – 4). The answers to the above paradoxes are at least fivefold: 1) Einstein’s principle of relativity is not correct; 2) the light beam is propagating at a lesser velocity relative to the observer who is moving away from it (Chapter 21); 3) there is no constant law of light propagation at c relative to linearly moving observers (Chapter 21); 4) the constant velocity of a light beam at c only applies to its transmission velocity relative to its medium of a vacuum, not to linearly moving bodies or observers (Chapter 6A); and 5) algebraically and simultaneously satisfying the constant propagation velocity of c for the same light beam with respect to two inertial observers in linear motion relative to each other is a physical and empirical impossibility (Chapter 21). In classical physics (that is physics before Einstein’s 1905 Special Theory), the word “relativity” was not generally in use. When it was used, it could have meant that most things in nature are not absolute, but rather have to do with relationships that we can perceive or observe with our senses. It could have meant “equivalence.” It could have referred to different perceptions and different coordinate measurements of the same event. It could have referred to Galileo’s and Newton’s mechanics concept of relativity. It also could have referred to the concept of relative motions, which was a hot topic for physicists and mathematicians between 1885 and 1904 (Poincaré, 1902, pp. 90, 111 – 112, 243 – 244). By early 1905, it could even have meant Lorentz’s April 1904 relativistic theories or Poincaré’s generalization of Galileo’s Relativity to include electrodynamics and optics. The point is, the word “relativity” never had a well defined meaning. Before we proceed further, we should pause and distinguish between the various forms and versions of relativity that are being discussed in this treatise (Memo 24.3). First, there was “relative motion.” In 1687, Newton stated that: “Relative motion is the translation from one relative place to another…” (Newton, Principia, Definitions [Motte, p. 6]). In 1902, Poincaré stated: “[T]here is no absolute space, and we only conceive of relative motion…” (Poincaré, 1902, p. 90). Later, Einstein agreed and correctly stated that “[E]very motion must be considered only as a relative motion” (Einstein, Relativity, p. 67). If we are only trying to detect or describe relative motion it is immaterial whether we “choose the carriage or the embankment as the reference body,” since neither is unique (Ibid, pp. 67 – 68). The observer on each body “has the same right…to say that he is at rest and the other is moving” (Dingle, 1972, p. 139). Relative motion was an empirical concept. Second, there was Galileo’s Relativity, the sensory equivalence (relativity) of all material bodies that are moving (translating) inertially or uniformly in a straight line, for the purposes of 1) demonstrating that each inertial body provides an illusion of rest, 2) that an observer on each body cannot tell whether he is moving or at rest, and 3) of empirically demonstrating that the accelerated motions on each spatially separated inertial body are physically and mechanically covariant, and thus also empirically demonstrating the invariance of Newton’s second law of motion (Chapter 5). Third, there was Lange’s 1885 abstract model of relative motion with two inertial frames of reference theoretically in relative translatory motion (Chapter 13). This model later became an abstract mathematical version of Galileo’s Relativity when the so-called Galilean transformation equations were added to it (Chapter 14). We call this combined version “Galilean Translational Relativity.” This abstract and mathematical version of Galileo’s Relativity was later adopted by Lorentz and Einstein for purposes of their own abstract mathematical versions of relativity. “The principle of relativity, according to which the laws of physical phenomena should be the same, whether to an observer fixed, or for an observer carried along in a uniform motion of translation…” (Lagunov, p. 25). “Poincaré’s generalized principle of relativity” prior to April 1904 is what Einstein later referred to as “the principle of relativity (in the restricted sense)” (Einstein, Relativity, p. 16). It theoretically applied to electrodynamics and optics as well as mechanics. After April 1904, Poincaré’s principle of relativity had the Lorentz transformation equations embedded in it (Chapter 16). It was this latter version that Einstein copied in 1905 for his Special Theory, sans ether. Fifth, in the late spring of 1904, Lorentz adopted Lange’s abstract model of relativity and Poincaré’s principle of relativity for his own 1904 relativistic contraction of matter theory. He then substituted his Lorentz transformation equations for the Galilean transformation equations and added his own modified concept of local time (Chapter 16). Again, this would be the mathematical model that Einstein would adopt for his 1905 Special Theory. Sixth, there was Einstein’s 1905 expanded “Principle of Relativity” (his first fundamental postulate), which asserts that: “[T]he same laws of electrodynamics and optics will be valid for all frames of reference for which the equations of mechanics holds good” (Einstein, 1905d [Dover, 1952, pp. 37 – 38]). As previously mentioned, Einstein’s Special Theory implies that the “equations of mechanics” in his first postulate must be the Lorentz transformation equations. In his 1916 book, Relativity, Einstein summed up what he meant mathematically by his expanded Principle of Relativity. “Every general law of nature must be so constituted that it is transformed into a law of exactly the same form when, instead of the space-time variables x, y, z, t of the original co-ordinate we introduce new space-time variables x′, y′, z′, t′ of a co-ordinate system K′. In this connection the relation between the ordinary and the accented magnitudes is given by the Lorentz transformation. Or in brief: General laws of nature are co-variant with respect to Lorentz transformations. This is a definite mathematical condition that the theory of relativity demands of a natural law…” (Einstein, Relativity, pp. 47 – 48). These radical versions of relativity have been described in detail in Chapters 20E and 24 of this treatise. Seventh, there was Einstein’s complete Special Theory of Relativity which adopts Lange’s abstract model of relativity, some concepts of Galilean Translational Relativity, many of Lorentz’s 1904 mathematical concepts and Poincaré’s generalized principle of relativity after April 1904 (Part II of this treatise). It also invents an arbitrary concept of “common time” (Chapter 25) and theoretically applies the Lorentz transformation equations to the propagation velocity of light at c relative to linearly moving bodies in order to make Einstein’s expanded “Principle of Relativity” and the rest of his Special Theory relativistic concepts and consequences mathematically consistent with his artificial second postulate for the absolute propagation velocity of light at c (Einstein, Relativity, pp. 37 – 65). Eighth, in 1907 and 1908, there was Minkowski’s ad hoc mathematical and geometrical concept of “Spacetime,” which was based on Lorentz’s and Einstein’s relativistic theories and which we shall discuss in Chapter 33. In 1915 – 1916, there was also Einstein’s ad hoc General Theory of Relativity (his elaborately contrived theory of a radical new type of gravity called “curved spacetime”), which inter alia contradicts Special Relativity and was also totally unnecessary and meaningless (Chapter 40). Finally, we have the author’s “Universal Principle,” which we briefly described in Chapter 18. All of the relativistic concepts that were invented after the first two empirical concepts (relative motion and Galileo’s Relativity) were theoretical modifications and mathematical extrapolations of the first two. However, these later versions were all abstract and mathematical, rather than sensory and empirical. 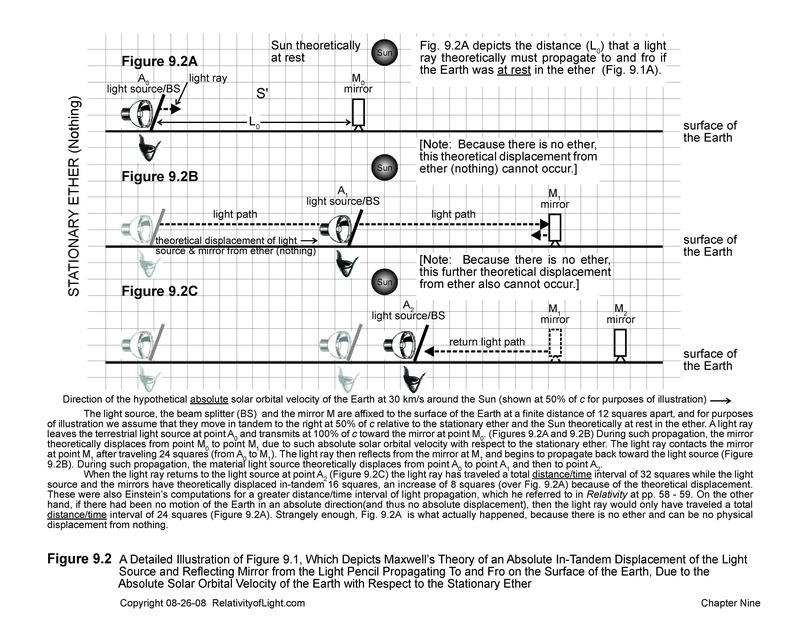 Again, for a shorter comparative list of all the above concepts of relativity, see Memo 24.3. 1) What relevance (if any) do material concepts and conventions, the relative inertial motions of material objects, and the limited material concept of Galileo’s Relativity have with respect to the velocity of non-material radiation (light)? 2) What relevance and validity (if any) did Einstein’s attempted justification of material relativity and his first fundamental postulate (his radical and expanded Principle of Relativity) have with respect to the velocity of non-material radiation (light)? The answer to both questions is: None. The principle of relativity for mechanics states that the mechanical laws of nature are the same for all observers who are in a state of inertial motion relative to one another. This principle is true, but it is only the most obvious and intuitive example of nature. It immediately begs the question: Are the natural laws of mechanics different for observers who are in other states of motion (such as accelerated motion or arbitrary motion) relative to one another? We now know, based on modern technology and techniques of measurement (such as lasers, television, space ships, particle accelerators, precision telescopes, electronic sensors, digital computers, sophisticated software programs, and the like) that the answer to the above question is in the negative. The laws of mechanics are the same for all observers no matter what their position, time or state of motion might be. In this treatise we have demonstrated and will continue to demonstrate that the same is also true with respect to the empirical laws of electromechanics, optics and light. Thus we must assume that all of the other laws of nature, such as thermodynamics, gravity, nuclear physics, astronomy, quantum mechanics, particle physics, and cosmology, must also be the same for all observers regardless of their position, time or state of motion, and regardless of Special Relativity. Only if and when we have clear and convincing empirical evidence to the contrary should we contemplate modifying these assumptions.